Hope that gives some help! Najeela is super sweet. My roommate recently built a deck that doesn't emphasize her activated ability, but it still has some good warrior options. One thing I notice immediately is that your mana curve is relatively high. 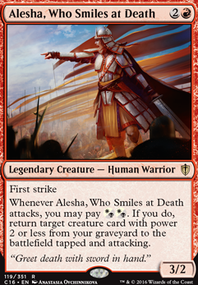 If you have enough low-cost creatures for it be worth it, Alesha, Who Smiles at Death can be warrior-based recursion. Aven Wind Guide boosts Najeela's tokens, literally. 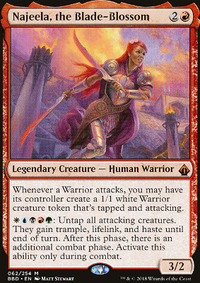 Brighthearth Banneret is great Warrior ramp. Did you know Champion of Lambholt is a warrior? 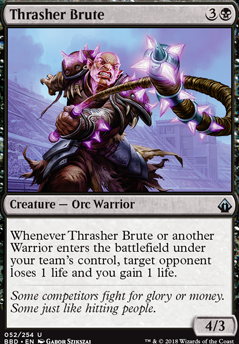 Also Mindblade Render, Rushblade Commander, and definitely Thrasher Brute from Battlebond. You don't have any enchantment/artifact removal, so I'd suggest adding a Nature's Claim or even Aura Shards. Honestly, I don't think Insidious Will or Settle the Wreckage are necessary. The deck isn't trying to be a control deck and with all the ways to give your chump blockers vigilance, being attacked isn't a problem. You also need more draw power. Skullclamp is where it's at. Bident of Thassa is also nice. Obelisk of Urd and Door of Destinies can buff all your warriors. Aggravated Assault is unnecessary. Bear Umbra only works on the one creature it's attached to. Consider Beastmaster Ascension, Fervor, Intangible Virtue, Parallel Lives, and the "safe" Coat of Arms, Shared Animosity. Skyshroud Claim isn't good in a 5 color deck and Genesis Wave isn't what the deck is wanting to do. 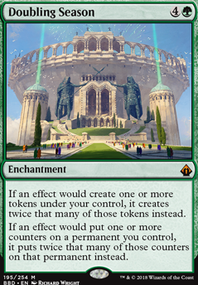 Consider Harvest Season for ramp and things like Blasphemous Act, Dreadbore, and Hull Breach for more removal. I'm not gonna say much about the land base other than you absolutely need at least some basics. Strip Mine is a thing and so is Blood Moon. Also, Unclaimed Territory and Path of Ancestry. I don't love Hazezon Tamar because he's so slow and also cost-prohibitive for most people. Dakkon Blackblade isn't worth his mana cost compared to other warrior options you have available. 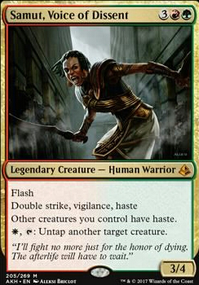 I'm not a fan of using the experience counter commanders in the 99 (Ezuri) because they never seem impactful enough while they're around. I think there's better/cheaper options to replace Jazal that aren't so white heavy. Rubblebelt Raiders only benefits itself. 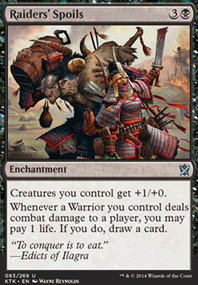 To summarize: make the deck more synergistic with warriors that support all warriors rather than just themselves, add more card draw, add more removal, focus on the goal of the deck. Awesome! Thats a heck of a showing. I played this past sunday in a "supersized draft" There were only 4 teams so 3 matches total and we went 2-1. I was playing R/G goodstuff and my partner was playing W/B kill all the things... both of us had a significant number of warriors as well. Match one wasn't looking good. Our opponents had us to 19 by turn 5 on the back of an early loyal pegasus and some other creature we couldn't block and an aura. We eventually got rid of most of their board and I was able to cast Stolen Strategy, my partner got a decent sized lifeliker with flying into play, and began to stabilize. After their quick start our opponents fizzled out and we eventually won on the back Bramble Sovereign into 2x 10/10 Apocalypse Hydra which wiped their board the following turn. Match 2 was an embarrassment. My partner and I both took admittedly slower looking hands but we were not prepared for the explosiveness of our opponents decks. They dumped out 4 smallish creatures early while we had nothing on board, then cast Regna's Sanction to pump everything and swing through for lethal in 6 turns... everyone was laughing (including us) because we were pretty sure two-headed giant games are not supposed to be that fast.